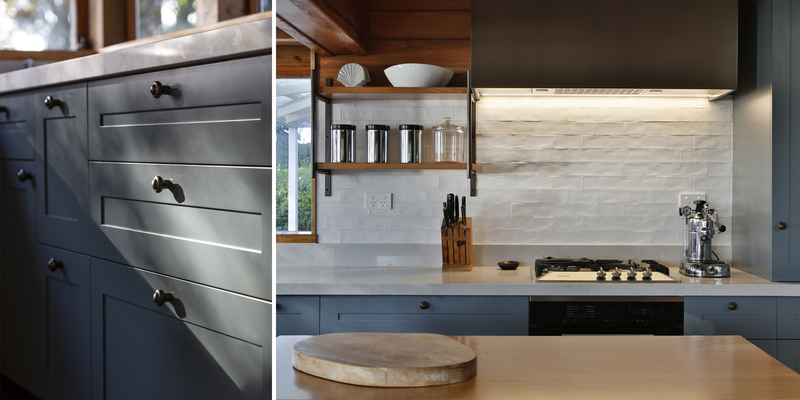 Kitchens By Design | Kitchen Design for Discerning Clients : Beachlands. 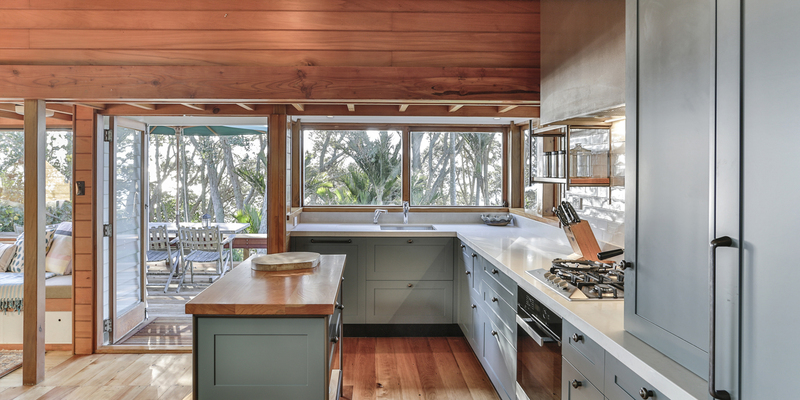 This kitchen was designed for an arts-and-crafts getaway home in a beautiful seaside location. The existing kitchen was badly in need of a revamp, but it was vital that its replacement was sympathetic to the wonderful character and original style of the house. While the overall kitchen space is quite compact, the request was that the bench space was maximised, new appliances inserted, out-of-sight storage designed for a few small appliances, plus space to store lots of platters and china. Improved workflow and a connection to the doors out onto deck were also asked for. The original kitchen was an L-shape, with a short return that restricted movement into and around the kitchen. The new kitchen retains this L shape, but the return was dropped in favour of a small island/table (moveable) that dramatically improves workflow and accessibility. 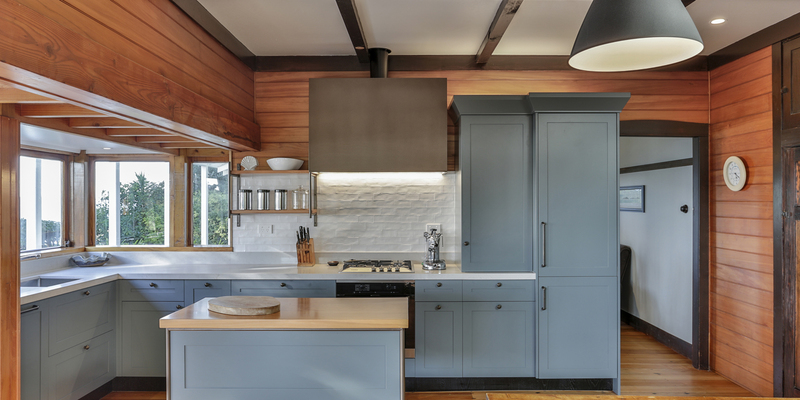 The grey-green colour and Shaker-style door and drawer panels, along with aged-metal paint effect and timber accents are all in keeping with the style of the rest of the home and contribute to a warm and inviting space. 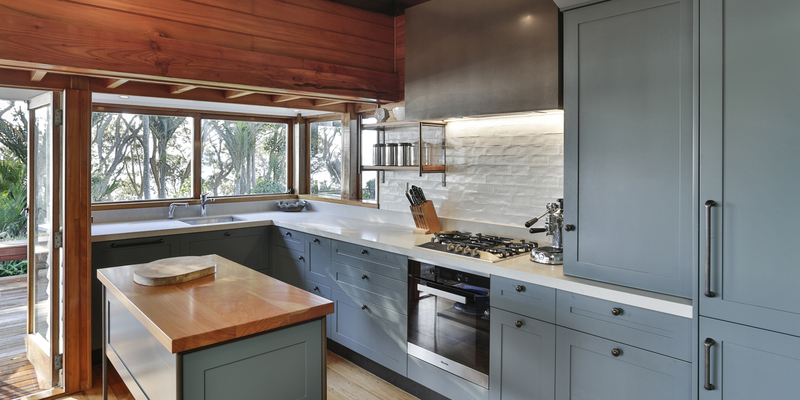 A subtly veined benchtop completes the look. 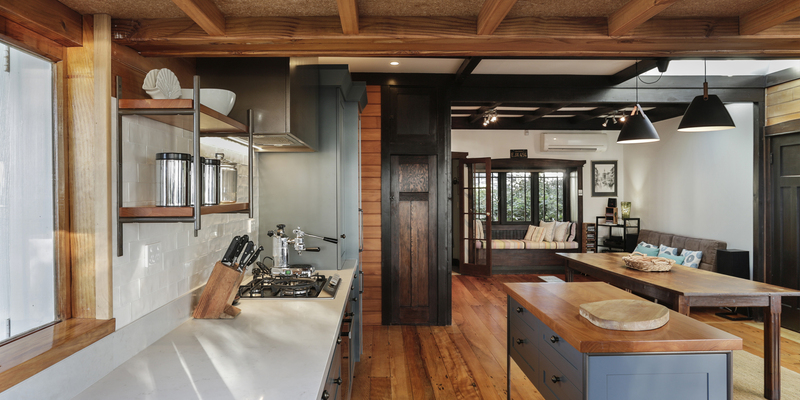 The grey-green colour and Shaker-style door and drawer panels, along with aged-metal paint effect and timber accents are all in keeping with the style of the rest of the home and contribute to a warm and inviting space.